This is another of Ramses II’s rock-hewn temples of Nubia, built in honour of Amon-Ra, the Horuses of Nubia and the gods of the cataracts. 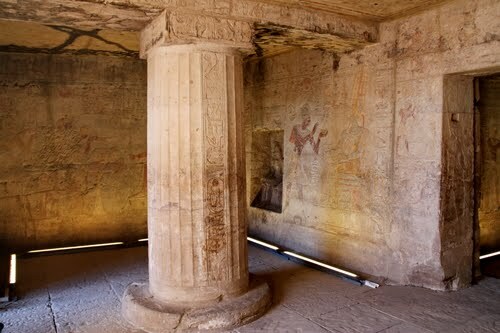 It was originally situated to the north of Kalabsha (see page 126) and has been moved to a site close to Kalabsha Temple, now near the High Dam at Aswan by a Polish archaeological team, financed by a joint Oriental Institute of Chicago/Swiss Institute of Cairo project. 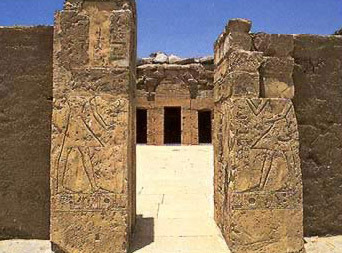 This is a small temple, comprising an outer courtyard (later converted into a church) a hypostyle hall and a sanctuary. The reliefs of the inner temple are well preserved, and there are some interesting scenes of the military campaign in Upper Nubia (bordering Kush), in the outer court, showing scenes of life in Kush. On the left-hand wall of the outer court, Ramses II is depicted in his chariot. With his usual bravado he charges the enemy who flee before him. He is accompanied by his two sons, each-of whom has his own chariot and chariot driver. The Kushites are armed with bows and arrows. The men, with their women and children, escape to their camp that is situated among the dom palm-trees. One woman carries a child in a basket held to her back by a strap round the forehead. Another, who is cooking, looks up in terror to see the Egyptians approaching. Towards the rear of this wall, Ramses, with his sons and noblemen, sits beneath a canopy while the Kushites bring him tribute. In the upper register are bags of precious objects, gold rings, bows, animal skins, shields, furniture including an ornamented chair, elephant tusks, and animals, including a lion and gazelles. In the lower register are prisoners, animals (monkeys, a leopard and giraffe), and women with their children. On the right-hand wall of the outer court are scenes of Ramses’ campaigns in Asia and Libya. They depict the usual themes of attacking the enemy fortress and Ramses holding a group of Syrian captives by the hair while he smites them with a raised axe. In another scene he puts a kneeling figure of a Libyan to death while his pet lion takes a bite out of the doomed man’s heel. Scenes of foreign campaigns depicted in a Nubian temple would appear to be designed to show the native peoples that Ramses was powerful from one end of the empire to the other. He is shown with Egyptian noblemen and princes, bowing slightly to him in respect. Three doorways to the rear of the court lead into the hypostyle hall, which has two stout fluted columns supporting the roof. Over the central doorway is the figure of Ramses in front of Amon-Ra. Other scenes in the hall are of conquests and offerings. The doorway to the rear, leading to the sanctuary, had niches for three seated figures on either side. All were badly damaged, but probably represented Ramses between his fellow gods. Ramses II is being embraced by Satis and suckled by Isis. On the left-hand wall he makes offerings to Horus and Amon-Ra. On the rear wall (on the sides of the niche) are figures of Min and Ptah. The right-hand wall shows Ramses suckled by Anukis, goddess of Elephantine. Towards the entrance doorway is a defaced figure of Ramses embraced by Miket. This tiny structure, only about 25 feet square and dedicated to two Nubian deities, once stood on a rocky hill not far from the site used for quarrying Nubian sandstone. Its delicate columns rising against the sky made it a landmark of the area. In its original position it faced north and its entrance was flanked by two Hathor-columns. It has now been re-erected at a site near the High Dam.